25 Madagascar Bourbon Gourmet Grade A Vanilla Beans 6~7"
Click the button below to add the 25 Madagascar Bourbon Gourmet Grade A Vanilla Beans 6~7" to your wish list. 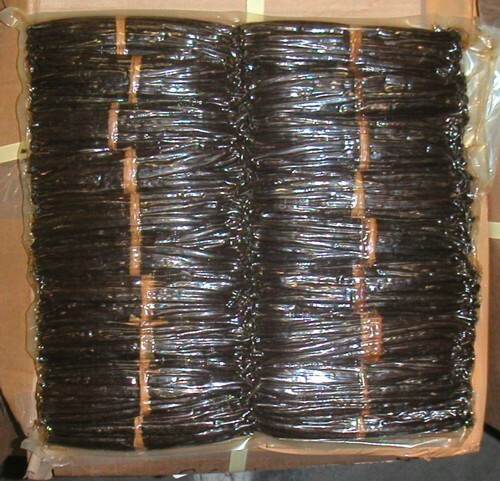 25 Madgascar Grade A Vanilla beans, 6 to 7 inches. Madagascar is known for growing the best beans in the world! The flavor of these beans is like you would find in vanilla extract that you buy at the supermarket. These Grade A beans are perfect for cooking or making vanilla extract. Below: Grade A vanilla beans vacuum sealed. Stop looking at any other beans! These beans are always soft, fragrant and vacumn sealed. Great product at a reasonable price compared to the high price of other vanilla choices. Very quick shipping. Excellent product. I have not found better for the price and service. These vanilla beans are plump and full of flavor. Fast shipping. Will use this company again. We make home made vanilla extract every year. Good product, shipped quickly. On receiving the vanilla beans they looked better then we bought at local store. My wife did a count and noticed there was only 19 bean and not the 25 it showed on the package. The vanilla beans were terrific and so was the service. I would recomend Vanilla Products USA to all my friends. These were, by far, the BEST vanilla beans I have ever used. They arrived quickly, and in great condition. They were reasonably priced and I will DEFINITELY be ordering again. Great product at a very good price. Arrived in excellent condition. Very fast delivery. Would highly recommend.